Pilot Mountain – Let's Go RVing! 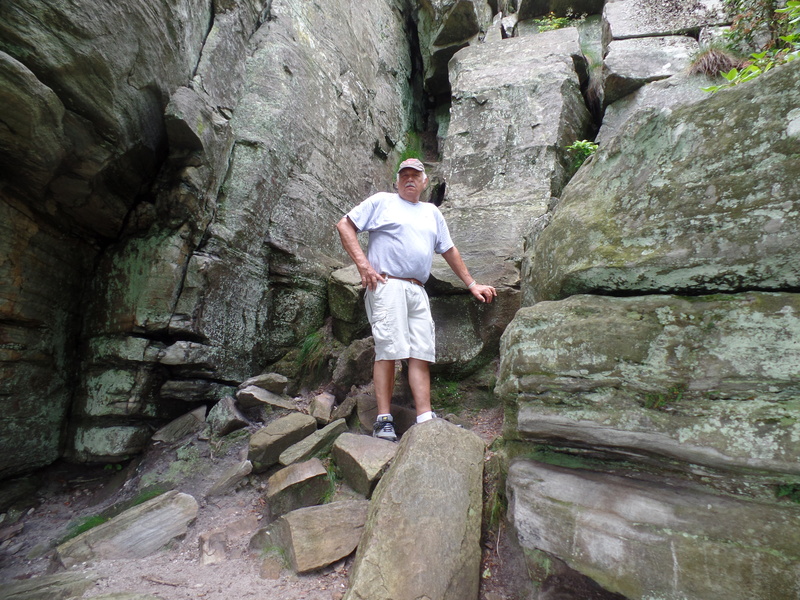 Today was our day to visit Pilot Mountain – the weather was nice and we were relatively free until we were to meet at David and Jane’s about 5:00 so we packed our lunch and took off. It actually took us nearly an hour to get there but it was a pleasant ride. As we entered the State Park we stopped by what I thought was the Visitor’s Center but if it was they certainly weren’t very welcoming. There was one lady working in there and she must have been doing something extremely important because she never looked up and never stopped. We went on out and decided we’d find our own way. The road is winding naturally and we just followed it up to the top. There is a large parking lot with a nice overlook. They also have nice bathroom facilities. We got out of the car and wandered around and eventually climbed the knob of Pilot Mountain. It’s not a bad climb at all and the view is beautiful. If we keep climbing mountains we’re going to have to invest in some better hiking shoes! After our hike we went back to the parking lot and tried to decide if we needed to explore further. We chatted briefly with a couple from Durham who had been on one of the trails and they discouraged us from trying saying it really wasn’t worth the effort. We’ll leave it for another day. We had our picnic lunch in the car at an additional parking lot located further down the mountain and then headed back to the campground to get ready to go to Emma’s recital.